“President James Buchanan: A Biography” is Philip Klein’s 1962 classic biography of our fifteenth president. Born into a family of historians, he grew up in Lancaster County, PA near where Buchanan was raised a century earlier. Klein earned a doctorate in history from the University of Pennsylvania and was a professor at Penn State; he died in 1993. Klein suggests this biography is actually a scaled-down version of the book he originally set out to write. Nevertheless it is a broad, extensive and valuable look at Buchanan’s life and career. It also seems to be the only full-scale biography of Buchanan published in the one-hundred-thirty years since a two-volume documentary work was published by Buchanan’s heirs. Rather than adding another voice to the chorus of historians vilifying Buchanan for failing to slow the nation’s march to civil war – or eradicate slavery from the continent – Klein portrays Buchanan as a well-intentioned, sympathetic figure who was never able to wrestle the nation’s intensifying sectional challenges to ground. But while successfully arguing that history’s judgment of Buchanan is too harsh, Klein is less convincing in his claim that in a different political climate Buchanan might have been a “great” president. 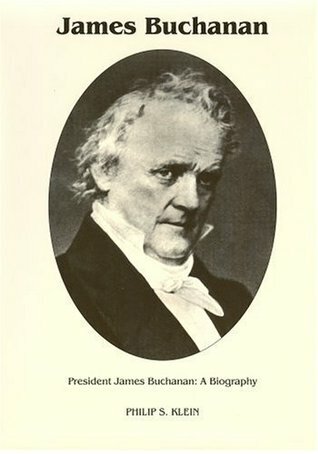 “President James Buchanan” is well-written, exquisitely researched, appropriately detailed and wonderfully penetrating. And by virtue of Buchanan’s long career of public service it provides an excellent review of a broad swath of American history (back to the Monroe administration nearly four decades prior to Buchanan’s presidency). Klein’s discussion of Buchanan’s process for selecting his Cabinet was particularly interesting. Also useful was his description of the Kansas-Nebraska Act and its volatile aftermath. In other presidential biographies, this Act is often laboriously described to the point of being incomprehensible to the non-scholar; here it is more cogently summarized. A few critics complain of excessive focus on Buchanan’s early political career. This is fair but for the fact that careful study of these years is designed to provide the reader with insight into Buchanan’s lifelong core political principles. On the basis of these unwavering tenets, Klein positions the older Buchanan as an honest, principled, and ill-timed president rather than a malicious, pro-slavery leader as some suggest. At times, though, Klein does seem too forgiving of Buchanan. Based on my recent study of the Polk presidency, this biography seems to dramatically understate Buchanan’s poor behavior (some might call it insubordination) as Polk’s secretary of state. While Klein does highlight the tension Buchanan brought to the Polk Cabinet, Polk’s biographers paint a far harsher – and more convincing – picture of Buchanan’s conduct during that time. Despite being otherwise thorough in its scope, Klein does not seem the least bit puzzled by Buchanan’s choice to remain a lifelong bachelor. Whether this lack of curiosity is due to an absence of historical evidence, or simply a desire by the author to leave private ground untrodden, I do not know. But in my experience biographers are usually more inquisitive than Klein in this instance. A more important missing element is a comprehensive post-mortem on the Buchanan’s presidential term. Klein consistently lays the groundwork for modest redemption of Buchanan’s legacy. However, he does not dedicate substantial space at the end of the biography to a full warts-and-all consideration of Buchanan’s presidency; such a discussion would have been enormously useful. Overall, Philip Klein’s biography of James Buchanan proves to be thorough, well-written, often interesting and always informative. For good reason “President James Buchanan: A Biography” is likely to remain the definitive biography of Buchanan for the foreseeable future. I’m not convinced it’s even possible to write a more interesting and instructive biography of such a dull and unsuccessful presidency. Ostend affair. But, this book is a must in any serious history library.